One of the most common and competitive arenas of book collecting is the acquisition of Modern First Editions. An acceptable definition of this pursuit is the collecting of first edition, first printings of fiction, published after 1900 in English. Personally, I like to broaden the definition to include all forms of fiction (not just from the commonly accepted, literary elite) all non-fiction and all illustrated books (commercially) published after 1900. Of course, as with any broad definition, the devil is in the details and executing a collecting strategy is ultimately dependent on the collector's goals, obsessions, interests, creativity and resources. Developing a Modern First Collection can mean simply, acquiring as many examples as possible from a wide range of authors, or focusing on one author and building a complete collection of just that author's works in all first edition format, US, rest of world, paperback, pre-publication, special edition, illustrated editions..... In either case the quest is essentially the same, acquiring the best example possible of the first edition, first printing of a given book. Personally, I fail miserably in the focused collecting of a specific author since I am generally unable and unwilling to pay the premium for the rarest and scarcest titles and I have a wide range of interests. That being the case, I do have an eclectic collection of Modern First Editions with clusters of first edition, first printings from the same author and examples from many authors across a wide spectrum of genres. Since I collect mainly what I like to read, I simply try to adhere by my first principle of collecting, never buy any book unless it is a first edition, first printing. $500,000 for a copy with a fine dust jacket! Collecting Modern First Editions is a very complex and competitive game. It is complex because figuring out which edition is actually the first edition, first printing is often difficult and the on-line catalog descriptions generally a minefield of confusion, subtle misinformation, misdirection and unnecessary complexity. It is competitive because acquiring the actual first edition, first printing requires finding a scarce book in the best condition possible for a price that matches your budget. 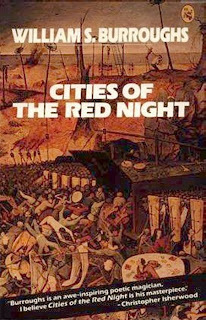 As an example of the quest I offer the challenges and confusion associated with collecting the first edition, first printing of the Cities of the Night trilogy by William S. Burroughs, 1914-1997. I read Cities of the Night in 1987 while commuting daily via bus from Salem, MA. to Boston. The weeks I spent reading the three books in the series were some of the best commuting reading I ever did! 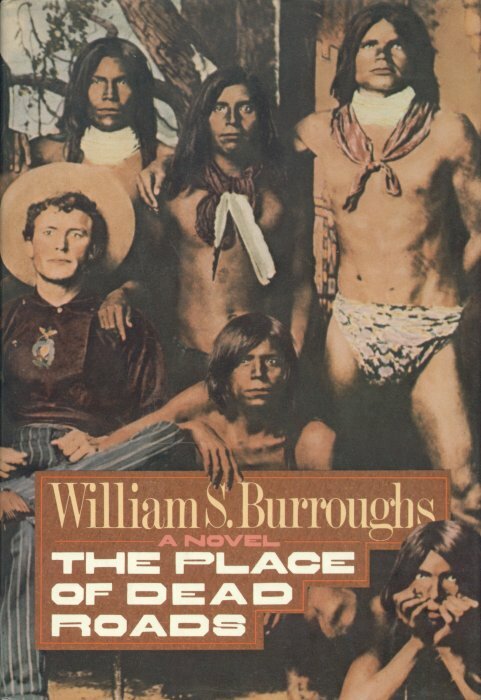 While reading these novels I kept wondering if anyone else along my commute had experienced reading the elder Burroughs, at his best, writing about hangings, the CIA, a rogue virus, gay cowboys and nuclear war and the end of the world as only he could envision. Ever since then I've been meaning to add a set of the first edition, first printings of the three books to my library. This has never been easy and over the years, when casually researching the title, I realized that in this case, my standards may need to be modified to match the reality of the marketplace. 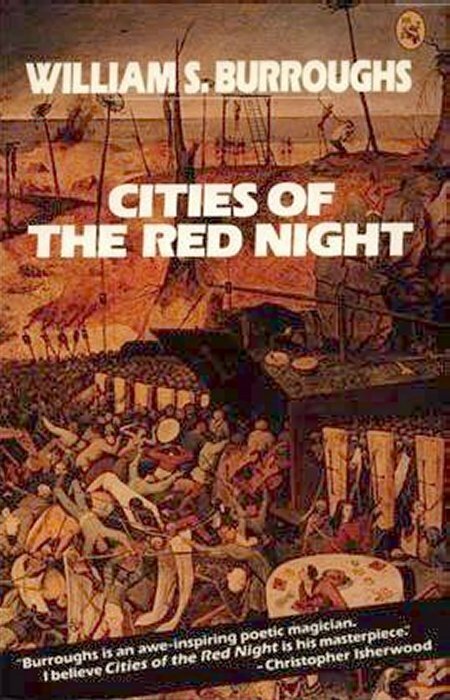 Cities of the Night was published between 1981 and 1987 in three volumes, Cities of the Red Night: A Boy's Book, 1981, The Place of Dead Roads, 1983 and The Western Lands, 1987. By the 1980's Burroughs was an established icon of the beat generation and the "turn on tune out" crowd equally famous for his writing and infamous for his behavior and lifestyle. His earliest publications were inspired by addiction and written under the long term influence of drink and drugs and he remains an icon. 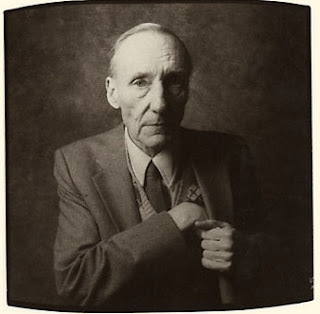 All are free to have an opinion on Burroughs and his books, regardless, collecting Cities of the Night is a fine example of the challenges when trying to acquire Modern Firsts. Cities of the Red Night, by William Burroughs, Holt, Rinehart and Winston, New York, 1981(John Calder, London, 1981). 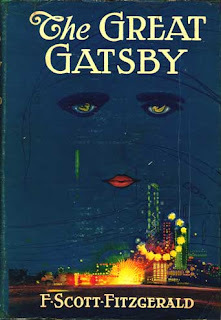 There were three variants of the first edition, first printing published by Holt which complicates any acquisition decision. This does not mean that there exist three separate printings of the first edition but that the first edition, first printing was offered in three varieties. 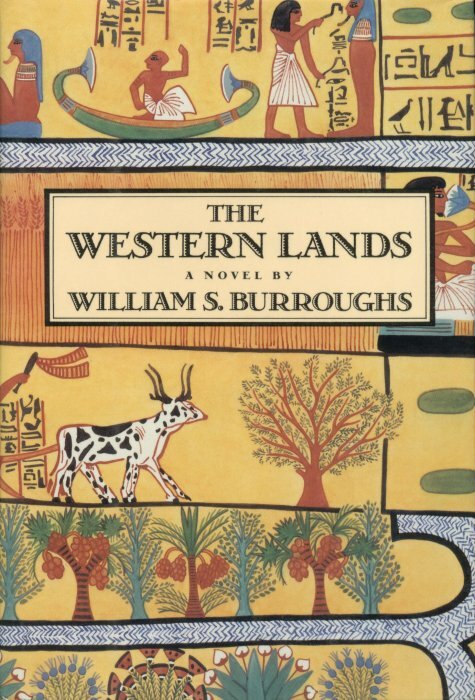 Two limited edition sets are known, one numbered from 1-500 and signed by Burroughs on the limitation page(hardcover, slipcase, no dust jacket), one lettered set, A-Z, signed by Burroughs on the limitation page (hardcover, slipcase, no dust jacket), and the "trade" first edition, first printing, which includes a dust jacket and was the edition released to the general public. I have never seen one of the lettered set offered for sale. The acquisition decision comes down to a choice between the limited edition 1-500 slipcase edition or the trade edition. The limited edition, either numbered or lettered, is, by design, more rare than the trade edition. A signed trade edition is more rare than an unsigned. While condition is always important juggling your desire for a limited/signed edition, signed edition or a best condition trade first will ultimately determine what you pay and what you add to your collection, condition-wise. Of course a Burroughs collector will need to acquire a copy of each variant as well as the London edition. The price range runs from $5.00 for a poor condition trade first to $400 for a limited, signed and numbered, edition . 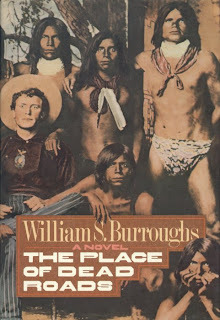 The Place of Dead Roads, by William S. Burroughs, Holt, Rinehart and Winston, New York, 1983(John Calder, London, 1984). In this case, there were 300 numbered and signed copies released with the slipcase minus the dust jacket, no mention of a lettered edition and two variants of the trade edition, one with full brown cloth and bronze print and one quarter bound in an orange-brown cloth, spine titled in metallic silver, light brown textured paper-covered boards released by Holt. There is no data on whether the full brown cloth or quarter bound with metallic silver were bound first but it seems that the more complex quarter bound would be more desirable. As always condition and author signature impact the price. In this case, prices range from $8.00 to $414 for a limited signed and numbered edition. 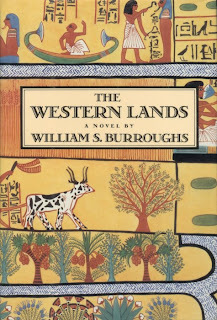 The Western Lands, by William S. Burroughs, Viking, New York, 1987 (Picador, London, 1988). With the third, and final, installment of the trilogy, there is only one version of the first edition, first printing. Which version of the trilogy to collect now seems to be dependant on whether or not you can stand to have a mismatched trilogy on your shelves. Or, I guess, you could decided to acquire the the limited edition, signed and numbered edition of the first two, and one each of the trade edition and even a signed copy of The Western Lands! In any event, acquiring the third book will cost anywhere between $8.00 and $290. I have not included prices for the pre-publication, galley proof, review edition of each title. In many cases when collecting Modern Firsts you will run into the pre-publication version printed and bound by the publisher and sent to media outlets prior to release of the actual book for review purposes. Traditionally these review copies have been created prior to final proof reading and final changes by the author and are not truly the finished work but in some cases are considered very collectible. Personally, I have enough trouble deciding on which version of the actual published book to buy and never pay attention to pre-publication versions. I still need to decide how I will eventually act to acquire my set of the City of the Night trilogy. After doing the pricing today, I am seriously considering simply acquiring one each of the reasonably priced trade first edition, first printing. I do not collect signatures and what I really want is simply a nice set of the trilogy on my shelves! Are you looking high profile model in India.. Here are introduce our Jaipur escorts and call girls in Jaipur to you, have a lots of fun with gorgoeus girls in city at moast affordable rates. This is an informative post review. I am so pleased to get this post article and nice information.Thanks for sharing with us. wow I want to thank you for this informative read, I really appreciate sharing this great post.